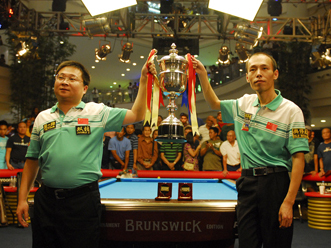 The Chinese team of Fu Jianbo and Li Hewen won the 2010 PartyPoker.net World Cup of Pool. In the final they defeated Philippines B (Dennis Orcollo, Roberto Gamez) 10-5 to claim the $60,000 first prize. The runner-ups earnt $30,000 for their efforts. Holders Philippines A (Efren Reyes, Francisco Bustamante) were beaten 8-6 by Indonesia in the second round. Jianbo and Hewen also won the trophy in 2007. The event took place from 7-12 September at Robinsons Place in Manila, Philippines. 32 teams took part. 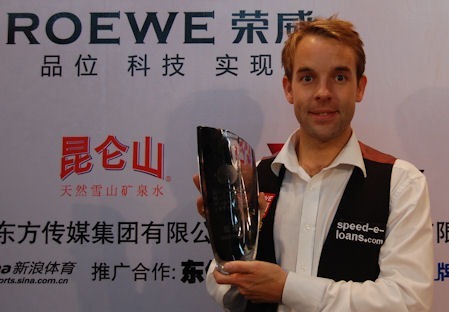 Allister Carter from England won the 2010 Roewe Shanghai Masters. In the final he beat surprise package Jamie Burnett (Scotland) 10-7. Jamie Cope and Mark Selby (both from England) lost out in the semifinals. Carter received £60,000 for the victory and Burnett got £30,000 for his runner-up spot. Stuart Bingham (England) had the highest break of the tournament with a 142. That earnt him £2,000. Defending champion Ronnie O'Sullivan (England) withdrew from the event due to personal issues. This was the second ranking title for Carter. H also won the 2009 Welsh Open. It was Burnett's first final. Carter improves to second place in the world rankings. Burnett leaps to 29th place. The currently suspended John Higgins (Scotland) stays on top, and current world champion Neil Robertson (Australia) sits in third. The rankings are now updated after every tournament. The seedings list is updated every few events. The tournament took place at the Shanghai Grand Stage, Shanghai, China 6-12 September, 2010. It was the first ranking tournament of seven on the 2010/2011 Main Tour. Next up on the snooker calendar is the 12BET.com World Open which starts 18th September 2010.